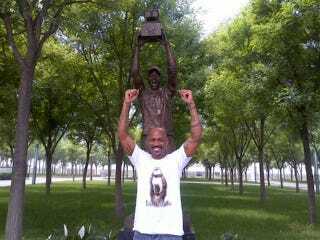 Last month, we told you that Stephon Marbury would be getting his own statue in China. Today, the dream became a reality. Sunday, the statue was officially unveiled on the lawn of the MasterCard Center, aka Wukesong, where the Beijing Ducks clinched their first-ever CBA championship a month and a half ago. Marbury attended the ceremony with many of his teammates. Starbury would go on to tweet many things—on varied subjects—including how blessed his life is, how all things are possible through Christ, the implications of his statue on world history and, of course, the debt the United States owes to China. Oh, and Dennis Rodman was there to give some sort of speech. We've cultivated a few of the greater hits. Congrats, Stephon. #Statuelife 'til we die.